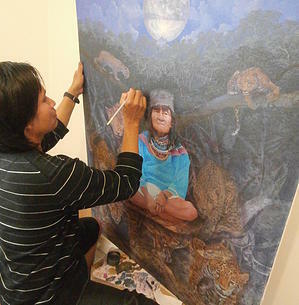 Come with a vision and begin a painting under the guidance of Peruvian Master Painter Luis Tamani. Luis will teach students how to visualise an Amazonian landscape with the proper technique. This landscape will form the background for a more detailed painting that students can continue on their own time after the workshop. Luis will be available to help with any questions on technique and skill. There will be a limited number of students so that each person is given attention and time. This is a once-off opportunity to work closely with a master painter from Peru and learn from his skill and craft. This workshop will run from 10am-5pm with a 1 hour break for lunch. Students must bring all the materials they need to paint, including canvas, paints, brushes, easel and drop cloth..
$100 AUD – Spaces are limited so be sure to reserve your spot now.